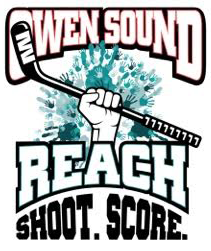 The Owen Sound Attack, in conjunction with the REACH Centre of Grey/Bruce, is pleased to announce 1st ever REACH. Shoot. Score. charity game in support of the REACH Centre of Grey/Bruce. Taking place on Saturday, Feb. 24 when the Attack take on the Peterborough Petes in a 7:30pm start, the Owen Sound Attack will host the REACH Centre in a memorable night that will include all of the hallmarks of Attack charity games. 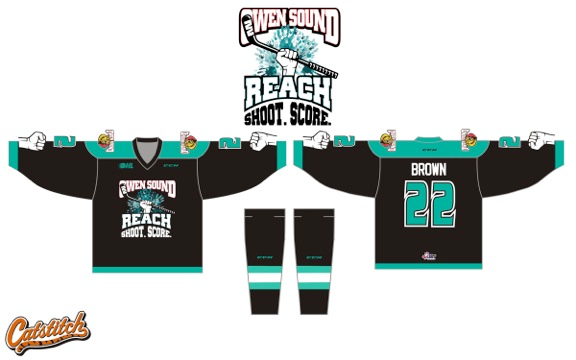 The team will don special jerseys, which can be viewed below, that will be auctioned off following the game in support of the REACH Centre, a non-profit organization supporting young adults with developmental disabilities. Events during the game will also include a silent auction, the Baywest Motors Inc. Bucket Pass, and the Belwyck Packaging Puck Toss with all monies raised being doing to the REACH Centre, founded in 2014 with the goal of providing meaningful growth and interaction opportunities for individuals with developmental disabilities once they had graduated high school. Attack Director of Public Relations, Shaun Bisson, says that the team is thrilled to partner with such a worthy group for what will be a fantastic night. Currently housed out of the Georgian Shores United Church, the REACH Centre offers a full day program for its participants three days a week. During those days, participants do a variety of different activities all with the goal of developing important life skills and engaging in the community. Founded with the mission of enriching the lives of young adults by providing a stimulating educational and recreational program, the REACH Centre conducts workshops on managing money, healthy eating and living, fitness, and other recreational activities such as art classes and social media. “Our short term goals are to be able to expand our program and to offer respite to our families. Long term, our dream is to be able to obtain an accessible building of our own to provide these services for our participants,” said Mimi Williams, Chair of the REACH Centre Board. “We are thrilled to be partnering with the Attack for the REACH. Shoot. Score. fundraiser, and are extremely grateful for their support,” she added. Prior to the game, the Attack and the REACH Centre will host a celebrity serve at East Side Mario’s on Wednesday, Feb. 21 from 6:00pm – 8:00pm. Members of the Attack will be on hand to serve meals, with East Side Mario’s graciously donating 10% of all food sales that night to the REACH. Shoot. Score. initiative. More information on the REACH Centre can be found HERE while specifics surrounding the game night will be made available closer to the Feb. 24 game against the Petes. Tickets for the REACH. Shoot. Score. game can be purchased at the MacVicar & McComb RE/MAX Attack Box Office, online at attackhockey.com, or by calling (519) 371-7452. The REACH. Shoot. Score. initiative wouldn’t be made possible if not for the efforts of our partners; Baywest Motor Inc., Bellwyck Packaging, Bayshore Broadcasting, East Side Mario’s, Avenue A Advertising, Graham Construction, as well as a number of anonymous donors. The Attack and the REACH Centre extend their sincerest thanks to each of these groups for their heartfelt contributions. This season of Attack Hockey is brought to you by Lerners Personal Injury Lawyers and Bertrand & Muzzell Paralegal Services.